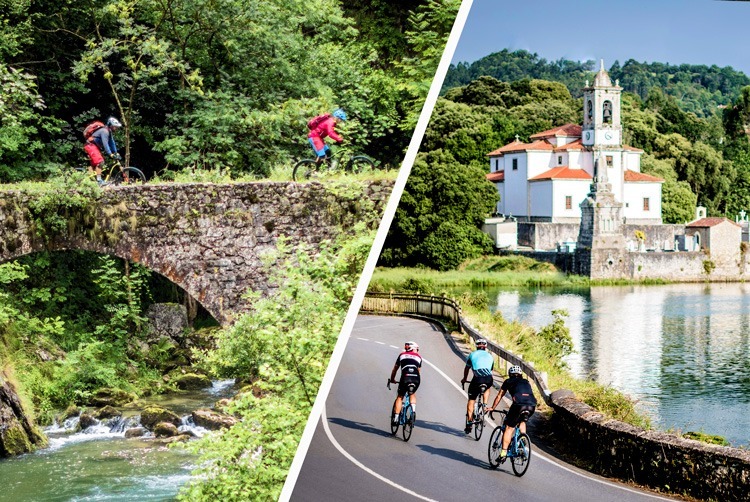 Hot on the wheels of our popular leisure cycling holiday, Camino de Santiago, are our two new itineraries for road cyclists and mountain bikers in 2019. For centuries pilgrims and travellers have made their way on a vast network of routes across Europe to reach the shrine of St James at the cathedral of Santiago de Compostela in Galicia. We’ve chosen two of these ancient and historical routes to create contrasting and yet equally enthralling tours of northwestern Spain. 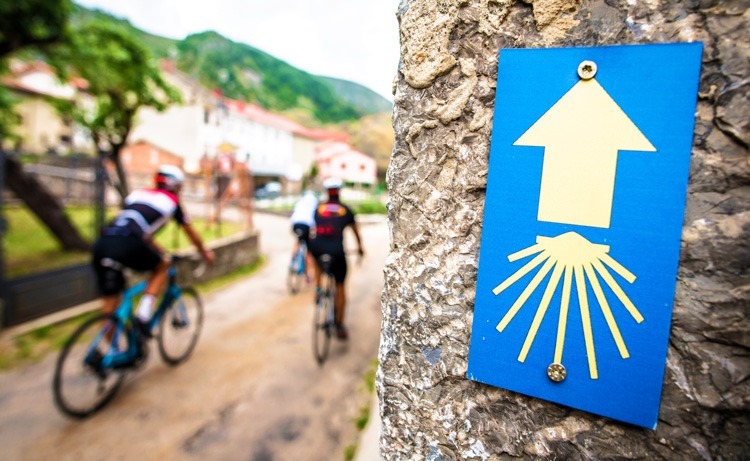 Mountain bikers will experience the Camino Primitivo or the ‘original way’ and road cyclists will join the most famous route, Camino Frances, after some time beside the Atlantic. So much more than cycling holidays — the myths, markers and moments with people along the way, are what make every Camino uniquely inspiring and moving. Well trodden for centuries by pilgrims, the Camino continues to attract walkers (and cyclists), with approximately 200,000 folk claiming their Compostela certificate at their journey’s end, each year! While the Camino remains a holy pilgrimage for many, it’s fast gaining recognition amongst outdoor enthusiasts too, owing to the sense of camaraderie and achievement upon completion. En route, you’ll experience Northern Spain’s stunning rural beauty; a land steeped in tradition, with sleepy villages in picturesque valleys, where the sound of cowbells drift on the air. One of the most distinguishing features along each route are the scallop shell symbols (commonly found on the shores of Galicia, one of the region’s you explore extensively on the trail) which help to guide the way to Santiago de Compostela, the final destination of the pilgrimage. 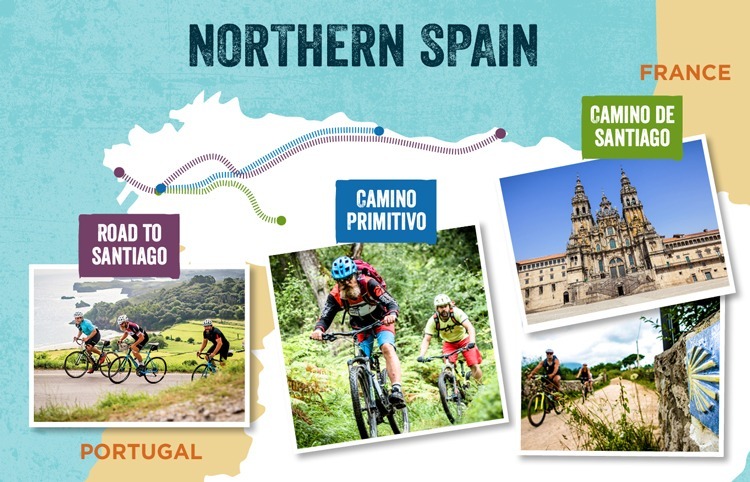 Experience the remote mountains of Northern Spain on this wild and thrilling mountain bike tour that follows one of the original pilgrim trails to Santiago de Compostela in Galicia. Starting at the magnificent cathedral in Oviedo, Asturias, the trails lead you through beautiful forested valleys, open pasture and mountainsides, taking in all the ancient hamlets that continue to host pilgrims on their journeys today. The terrain is varied with sections of ancient drovers’ trails, sinuous single track and back lanes. While challenging climbs are rewarded with thrilling descents, the ultimate finale is on the famed Camino Frances with its flowing, ancient trails. Culture and cuisine along the ‘Way’ await. Ride along the Atlantic coastline from fishing village to fishing village, passing through the foothills of the Picos de Europa national park, where its serrated peaks are to be gawped at and not conquered. You’ll visit the great cities of Oviedo, Lugo and Santiago, as well as the wild Cordillera Cantabrica mountains with their ancient settlements and way of life. By design our route combines several variations of the Camino de Santiago, including the Camino del Norte along the coast and the Camino Primitivo through the mountains to Santiago. For centuries, arrival in Santiago has marked the end of a special journey for countless pilgrims. Your journey, however, is far from over as we pedal on to Cape Finisterre… The End of the World. Cider or sidra is big in Northern Spain, especially in Asturias, the region’s biggest producer. From pressing to fermentation to bottling, it takes around five months. The process is completely natural and the drink is not carbonated. It’s due to the lack of bubbles that’s led to the best bit about northern Spain’s famous, refreshing Sidra – the pouring. In Chigres, or cider bars, trained Escanciadors will expertly lift each bottle of cider above their head and pour the contents into the glass, two feet below. It’s a strange and wonderful sight to behold but it’s more than a great photo opportunity, the height at which the drink is poured “breaks” the cider in the glass and injects some air to create bubbles. We’ve been told, it’s best to drink immediately after pouring and we’ve never been ones to ignore the local advice! Feeling inspired? Camino Primitivo and Road to Santiago are new to our range for 2019. Visit our website to view our full range of trips in this region. You can also download the trip notes to find out everything you need to know about these varied and exciting routes.